ViBe, the android smartphone app that lets you set and create custom vibration patterns for incoming calls and text messages crossed some major milestones last week. ViBe is now featured as a ‘Staff Pick‘ on Google Play (previously called Android Marketplace). ViBe became a top 10 trending application on Google Play. All this while, the dev team is working hard and pushing out constant release. Their lates update to the ViBe app includes localization in Spanish and German. 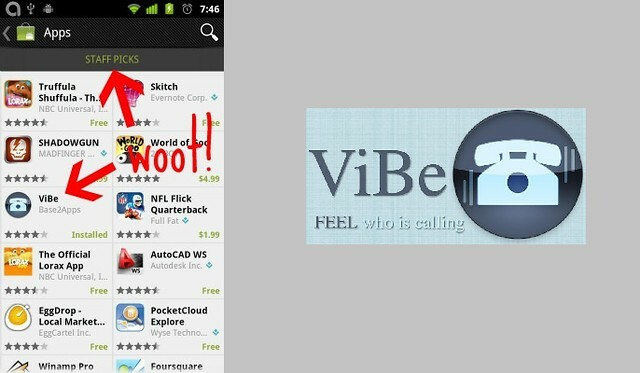 For more on what ViBe does, check out our original story on the app – FEEL Who Is Calling You With The ViBe Android App. One Response to "ViBe Hit Top 10 Trending App List On Google Play, Gets Featured On Staff Pick"
We can always count on oObly to have the latest and greatest news! Thanks for the update! Woot Woot!